Of all the changes Google is introducing with Android O, none will be more divisive than its decision to kill off its much loved/hated blob emoji in favor of more traditional-looking characters. And by traditional, I mean incredibly generic. I’d be happy to write an entire manifesto on why the old gumdrops are better, but my old colleague Natt Garun already did a great job of that in this post for The Verge. Besides I recognize not everyone feels the same, so instead allow me to discuss a solution for everyone: It’s long past time Google allowed us to choose our own darn emoji. Of course, I’m not the first person to suggest this, because emoji on Android have always been an inconsistent mess. Pick two random Android devices from a crowd, and chances are they’ll have a completely different set of emoji. …your friends will think you’re a cannibalistic serial killer. 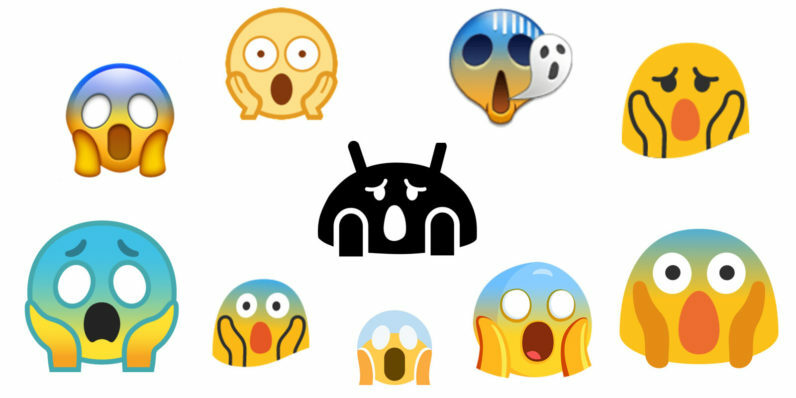 Fortunately, most Android manufacturers have wised up and started using stock Google emoji the last few years. That’s a step forward, but it’s still a problem: Google’s own emoji have changed significantly over the years – and even moreso than usual with O. This wouldn’t be a big deal if everyone immediately updated to the latest Android version, but Android is plagued by fragmentation. Android O may technically be launching this year, but who knows how long it will be until manufacturers have caught up and most people have actually updated. Until that happens, people will be sending messages with no guarantee the recipient is seeing the same characters. And by the time most people are on Android O, some will have moved on to Android P, which might bring further changes. It never ends. One simple solution would be to separate new emoji packs from Android OS, so they can be updated independently. But that isn’t going to stop third party manufacturers from going their own route, nor is it going to prevent apps from using custom emoji packs. Facebook Messenger, for example, uses custom emoji to maintain consistency across devices. Snapchat uses Twitter’s Twemoji on Android devices (weirdly, Twitter doesn’t), while WhatsApp – owned by Facebook – uses Apple emoji. Yeah, it’s confusing. Even within a single Android device, the emoji experience isn’t consistent. But letting users install their own emoji can mitigate all these problems. Most users would simply receive official emoji updates from Google, while grumps like me can stick to the old blob design. If you like Messenger’s emoji, you install those. If most of your friends use iOS devices, you can keep your chats consistent across platforms. Maybe there will be new emoji packs that better reflect your personality and aesthetic choices. And you might even be able to mix and match if there are individual emoji you’re truly fond of. You could counter that allowing everyone to install whatever random emoji pack they find on the internet would just make things messier, but Google could prevent that by simply burying the option somewhere most users never access, like developer settings or the System UI tuner. It’s still better than having to root your phone. To some this whole argument might seem a little trivial, but like it or not, emoji become are becoming a bigger part of everyday conversation. They may just be tiny images on our tiny screens, but emoji help people express themselves more efficiently, convey a bit more personality, and transcend language barriers. Heck, sometimes emoji even develop a language of their own (see: 🍑). Somewhere down the line, the big companies will have to confer and figure out a way to maintain consistency across platforms – perhaps by sharing emoji packs across platforms. Until then, the least Google could do is make it easier for people to say what they really mean.